The Genealogical Society of Utah (GSU) have microfilmed a large number of English Parish Registers and many other church records. 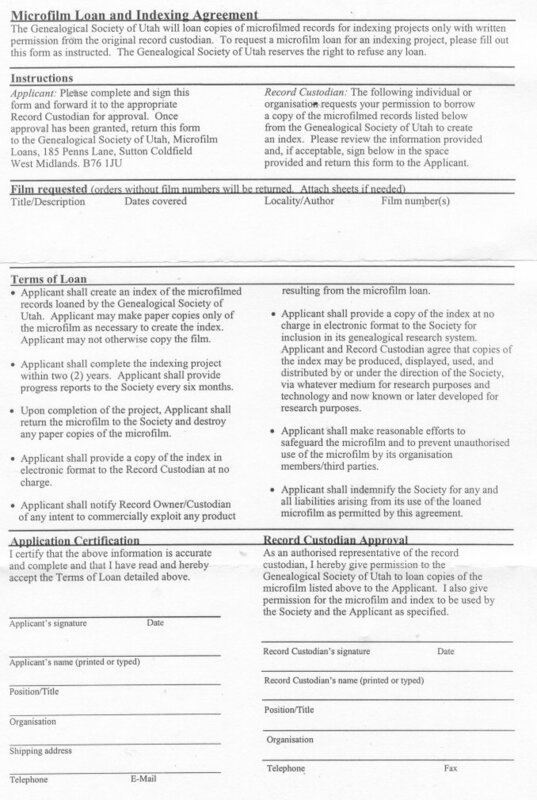 GSU are prepared to loan microfilm to transcribers for use at home if certain conditions are fulfilled (see "Terms of Loan"). Microfilm is ideal for transcribing, can be read on a microfiche reader but has more resolution than microfiche. The "Record Custodian" may be considered to be the Head Archivist of the Derbyshire Record Office at Matlock (for Derbyshire records) OR the present Vicar or Curate of the Church from which the records originate. An Index is usually produced by a database, and may be simple (with just Surnames and firstnames in alphabetical order) OR contain the complete record which is then listed in some specified order by the database software. (in this example, Film numbers for Bonsall Parish Registers are sought). Click on: Family History Library Catalog. Click on: England, Derbyshire, Bonsall. Click on: Parish Registers 1657-1950. Click on: View Film Notes. FHL British Film 1041097, 1041098, 2081100 for various dates. information requested on this form to him/her for collation. Daims View will be provided to you at no cost if you checked "yes" above. for your report, please provide the report by March 4th in your format. Compiled, formatted, hyperlinked, encoded, and copyright © 2004, John Palmer All Rights Reserved.